The Macadamia nut, arguably the king of nuts is said to be an ancestor of Frank’s, a once Macedonian prince who was transformed into a nut by a jealous goddess. Well, misfortune aside this is the greatest thing to happen to the muffin world because now the Prince comes to Frank in visions bringing him sweet dreams and recipes. This is one of them. 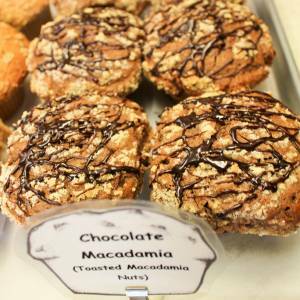 And he did: Chocolate Macadamia.